The multi-award-winning Esenza is a beautiful beacon of modern design. Cast in high-tech ceramic, it blends a seamless case and bracelet with revolutionary technology. There’s no crown. To set the watch, simply touch the side of the case and move your finger. Welcome to the future. Rado is a family watchmaker, established in 1917. Right from the start, the brothers who founded Rado worked to break barriers and create innovation. They introduced scratchproof sapphire crystal and harder-than-steel ceramic, and by this point Rado have almost entirely reimagined the watch. 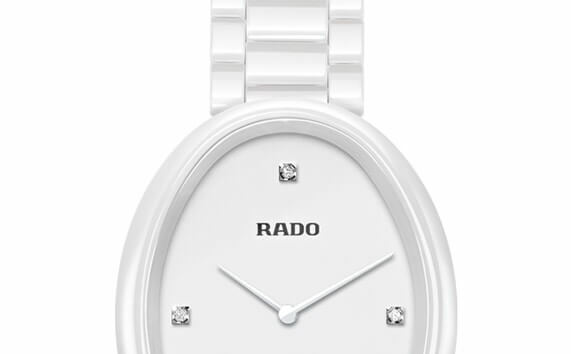 Introduced in 2013, Rado’s magical Touch technology gives the wearer satisfying simple control. The removal of the crown gives the case a sleek, symmetrical design – and the glossy, ceramic bracelet reinforces that look of luxury. Rado collaborates with global designers to continue to launch cutting-edge watches, incorporating its now-famous materials and technologies. High-tech ceramic is a signature material used in many Rado watches. It is harder than steel and amazingly scratch-resistant. Because it’s ceramic, it warms quickly to skin temperature and is light and hypoallergenic on the wrist. 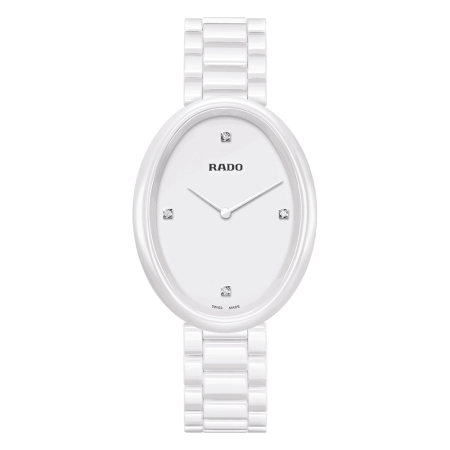 Rado uses high-tech ceramic and the metallised plasma high-tech ceramic on almost all its watches, but it really shines when the case and bracelet can be seamlessly integrated for added strength. We love Rado. At PureJewels we have stocked Rado for over 35 years, and currently carry a range of several collections. So if you’re a fan of Rado watches then pop in – and if you’re not, come along and prepare to fall head over heels. Rado is an exceptionally fine Swiss watchmaker with an eye for future tech and iconic designs from every decade. Esenza was launched in the early 2000s and is an elegantly minimal design for men and women. With or without diamonds, Rado Esenza is a timeless watch that will become a dependable, and much-loved, part of your daily routine.